Is Life merely a journey from birth to death? Does Life end with Death? Is there more to Life than just a mechanical process? Is there a purpose and meaning to Life? While the modern worldview owing to its Abrahamic origins considers this life as a onetime event, a journey that ends at death forever, the Indic worldview, which is informed by Hindu philosophy posits life as a perpetual journey of the Jiva-s from one body to another body until this journey finally comes to an end with the realization that this entire cycle of birth and death was merely an appearance, a superimposition which when removed leads to the reality of Atman as one birthless unchanging infinite whole. Death in Indic worldview is not a full stop, but merely a comma, where the Jiva discards the old body and takes up the new. In other words, Life is a journey from unreal to real, from ignorance to knowledge and from death to immortality as beautifully summarized in the famous verse from Brihadaranyaka Upanishad (1.3.28): असतो मा सद्गमय | तमसो मा ज्योतिर्गमय | मृत्योर्मामृतं गमय || Thus, the ultimate goal of life is Knowledge and Liberation, which in Hindu philosophy is called as “Moksha”. It may be asked that if knowledge and not pleasure is the goal of life as Swami Vivekananda posits, what about pleasures? What about happiness? After all, we can see in our own experience, as well as the experiences of others that our life is driven towards pursuit of happiness. We are forever indulging in various activities to fulfil our desires and derive happiness from it. The pursuit of education, job, marriage, children—all these are aimed at deriving happiness and satisfaction in life. If there is no place for pleasure and happiness in life’s journey, is it even worth living such a life? Rephrasing the question, we can ask whether there is a framework to better understand our life, our desires, and our needs, and to reconcile the dichotomy between the pursuit of pleasure and knowledge, so as to arrive at a more informed understanding. “Purusha” means a human-being or a Jiva and “Artha” means goal, purpose, or meaning. Purushartha means “goals of life”. Hindu dharma conceives of a four such goals: Dharma, Artha, Kama and Moksha. This framework of life wherein each human being has been conceived as having an obligation to pursue the four-fold goals in his or her life is a unique and very important contribution of Hindu philosophy. Human life is considered very precious in Indic civilization because when compared to plants, animals and other organisms, it is humans alone who have a fully developed faculty of intellect. All organisms except humans are invariably driven by natural instincts. It is humans alone who can exert their discrimination and free-will. To regulate this free-will and provide a guidance for the exertion of choices in a righteous and meritorious way that the Hindu philosophy has conceived this fourfold Purushartha-s. While Artha and Kama refer to pursuing sensory pleasures and material prosperity, respectively, Moksha refers to pursuing Self-Knowledge that results in ultimate liberation from the Karmic cycle of birth and death. Every person has one or the other desires they want to accomplish. The desire may be to look beautiful, or to earn money or having a relationship with a person. All kinds of desires are categorized under Kama. Similarly, all wealth, all objects that are acquired in order to fulfil these desires and enjoy a comfortable and secure life is termed as “Artha”. But, is it desirable to pursue all sensory desires and objects with no restraint? The answer is no. For example, a person who commits murder out of greed may end up in prison. Similarly, a person who sexually assaults someone to satisfy his sexual urges may also end up in prison. The point is, reckless and unmindful pursuit of Kama and Artha will ultimately result in suffering in one way or the other. To prevent such a disastrous outcome, the Hindu tradition posits Dharma or the sense of righteousness and duty as an independent goal of life. Using this Dharma, one can decide whether an action is desirable or not, whether an object of pleasure must be pursued or not. Thus, Dharma in the form of righteous duties facilitates each individual to attain all the four Puruṣartha-s.
To understand the necessity and importance of Purushartha-s in life, let us correlate the elements of Purushartha framework with elements of Maslow’s hierarchy of needs. Abraham Maslow was an American psychologist who conceptualized the famous Maslow’s hierarchy of needs in 1943 to explain and better appreciate various human needs that motivates people to work towards fulfilling them. He categorized various human needs into a 5-tiered pyramidal model and placed the most basic physiological needs like food, clothing, warmth, etc. at the very bottom. Above this, he places the human need for safety and security in life. The third position in the hierarchy is occupied by the emotional needs of people like the need to feel loved, emotional security, having intimate relationships, etc. Above this is placed the esteem needs i.e. the need to feel self-respect and esteem in what one is and what one does and the need to feel accomplished. Finally, at the very top, Maslow places, the goal of self-actualization. In short, Maslow places the most basic human needs at the bottom, the psychological and emotional needs at the middle, and what he calls as “self-actualization” at the top. • Physiological and safety needs, which at the bottom of Maslow’s hierarchy corresponds to Artha of Purushartha model. • Emotional and Esteem needs, which are at the middle of Maslow’s hierarchy corresponds to Kama of Purushartha model. • Self-actualization, which Maslow defines as “What a man can be, he must be” (Maslow, A (1954). Motivation and personality. New York, NY: Harper), refers to each individual’s inner potential and the individual’s need for realization of this potential in life. This is nothing but the Svabhava or the inner-calling of an individual that manifests as Svadharma. In other words, Self-actualization corresponds to Dharma of the four-fold Purushartha-s.
• While Moksha did not find any place in the original Maslow’s hierarchy, in his later years, he created a new category called self-transcendence, higher than self-actualization, which he posited as a higher goal rooted in spiritualism. It is interesting that just as Maslow presented the needs in the form of pyramidal hierarchy, the Hindu texts categorizes the goals of life in a particular way as well. While the order of priority in the Hindu scheme is Kama, Artha, Dharma, and Moksha as far as relative merit is considered, the order of categorization available in Hindu texts is: Dharma, Artha, Kama, and Moksha. Moksha is placed towards the end to denote it being the ultimate goal of the journey of Jiva through many lives, Dharma is placed at the very beginning highlighting its prominent position as well as its connecting aspect. As Brahmmasri S Gurunatha Ghanapadigal notes in of his lectures that Dharma is placed at the very beginning, since pursuing Dharma will automatically result in one attaining other purusharthas as well. Thus, Dharma is considered as the principal purushartha. As if reflecting this Hindu understanding, Maslow’s hierarchy places Self-actualization at the very top of the pyramid indicating it as the most prominent and defining need. 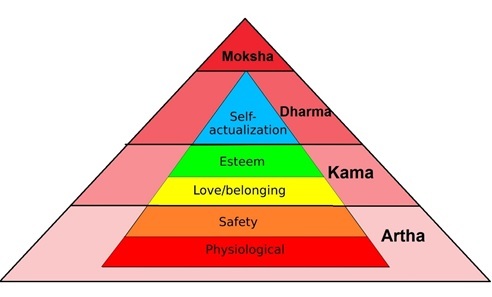 Similarly, Maslow places Safety and Physiological needs at the bottom indicating their foundational importance in life reflecting how after Dharma it is Artha and not Kama is placed in the Hindu scheme. Despite its numerous limitations, what such a correlation between Maslow’s pyramid and Purusharthas bring out clearly is the realization about how puruṣārtha-s are very vital for people to lead their lives to the fullest. An individual will feel content and fulfilling in his life only when he is able to understand his inner temperaments and potentials, and then strive towards realizing these potentials in life. Such a realization of inner-calling when pursued together with fulfilment of other needs of life: both mundane and spiritual, leads one to true happiness, knowledge and contentment. Such a comprehensive way of living one’s life by performing righteous actions is called as “Svadharma” and through the pursuit of this Svadharma, one finds meaning to life and attains self-actualization. Meaning: One’s own duty, though defective, is superior to another’s duty well-performed. Death is better while engaged in one’s own duty; another’s duty is fraught with fear. So, what does it imply to practice Svadharma? Hindu Dharma enunciates two aspects of Svadharma: Samanya or Universals and Vishesha or Specificities. Samanya are ethical tenets like truth, non-injury, non-stealing, sense-control and purity which have universal applicability. Vishesha dharma refers to tenets which are contextual and changes from person to person. These are special duties which are unique to individuals based on their location, time, inner temperament, competency and stage in life. Two most important elements of this Vishesha Dharma are Varna and Ashrama. Varna refers to an individual’s temperaments, inner calling, potential, and competencies. Varna Dharma is the life path which caters to this inner calling. Based on whether one’s inner calling is towards pursuit of knowledge, politics & administration, wealth, or creative arts and service skills, an individual can be classified into the categories of Brahmana, Kshatriya, Vaishya, and Shudra, respectively. Ashrama dharma refers to actions that are obligated to be performed based on one’s stage in life: student, householder, forest dweller, or a renunciate. Together, they provide a comprehensive path of svadharma, which can take an individual towards self-actualization. Notably, this model places knowledge, particularly spiritual knowledge (Adyatmavidya) and transcendent knowledge (Atmavidya) as the ultimate goal and posits them as the source of infinite happiness and bliss, and thus reconciling the dichotomy between knowledge and pleasure that we discussed at the beginning of this essay. Life is basically about making choices and performing actions. But, a person’s need of actions is dependent on the Purusharthas. One may perform an action either to fulfil a call of duty (Dharma), or to fulfil a material desire (Kama & Artha), or to fulfil a spiritual hankering (Moksha). Whatever be the motive, a balanced way of pursuing these goals is needed for overall fulfilment in life. Bhagavad Gita provides three such approaches or comprehensive pathways for balancing the Purusharthas and working towards self-actualization. These are Karma Yoga, Bhakti Yoga, Jnana Yoga and Raja Yoga. Using this framework of different Yoga-s from the Bhagavad Gita, one can fine tune one’s attitude towards life and prioritize the Purusharthas. One can then pursue them in a balanced manner and attain a more fulfilling experience of life. Thus, an understanding of the framework of Purushartha-s can be life changing. It facilitates each individual to align their lives towards Self-actualization, and discover a meaning and purpose to this journey. This article was submitted for the Essay competition for Dr Bharat Gupt’s workshop previously announced here. Nithin Sridhar has a degree in Civil Engineering, and having worked in construction field, Nithin passionately writes about various issues from development, politics, and social issues, to religion, spirituality and ecology. He is Editor of IndiaFacts & Advaita Academy and is based in Mysore, India. His latest book “Musings On Hinduism” provides an overview of various aspects of Hindu philosophy and society.